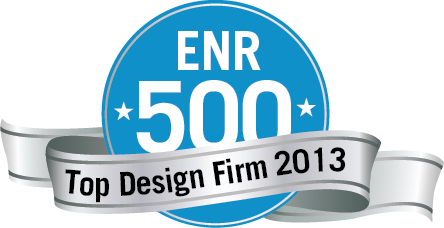 Engineering News-Record (ENR) annually ranks the largest US-based designs firms, both publicly and privately held, based on design-specific revenue. In 2012, American Structurepoint reported $56.7 million in total revenue, with 52 percent of our market share in transportation alone. The Ohio River Bridges East End (ORB) project, one of the largest ongoing infrastructure improvement transportation projects in the nation, which costs $763 million and is scheduled for completion in October of 2016, is one of several major projects contributing to our success. According to ENR, the companies on this year’s Top 500 Design Firms list totaled revenue of $61.86 billion in 2012 in the US, up 5.5 percent from the previous year. This marks the second year the Top 500 experienced revenue growth since the recession began. American Structurepoint is continuing its steady climb up the list, having been named No. 183 out of 500 total companies nationwide. Our comprehensive services complement one another, and that helps us reach more clients. In 2012, we laid solid groundwork for prosperity that will be realized in future years. Nationally, transportation services (at 19.2 percent) and general building projects (at 20.7 percent) remain at the top of the markets’ share of total revenue. This has also been reflected in American Structurepoint’s success, as our firm has landed major transportation jobs in the past year, including having been selected on the team to design the ORB project, which was recently named the No. 1 project among the “Midwest Top Project Starts of 2012” by ENR Midwest, ranking the highest out of 50 projects across the region. We are serving as the subconsultant to the lead design firm, Jacobs, which is headed by prime contractor and developer team Walsh Construction, VINCI Concessions, and Bilfinger Berger. Since having been founded in 1966, our success as a transportation engineering firm has enabled American Structurepoint to grow from just two employees to over 275 professionals across 11 disciplines, including architecture, civil engineering, construction inspection, environmental, information technology, investigative/ forensics, land surveying, planning, structural engineering, transportation, and utility infrastructure services. I believe we’ve made great strides in building a strong company that can compete in this ever-changing market. We are built to deliver quality, built for speed, and built to deliver our client’s strategy.